Luxury Mountain Cabin, Amazing Views, Near Blue Ridge Parkway- 7th night free! Our cabin is in the heart of Ashe County, North Carolina. This beautiful property is conveniently located in Fleetwood, just 15 minutes from the towns of Boone and Jefferson. In addition we are about 20 miles from the trendy town of Blowing Rock where you can enjoy a day of shopping and dining at both sophisticated and casual stores and restaurants. 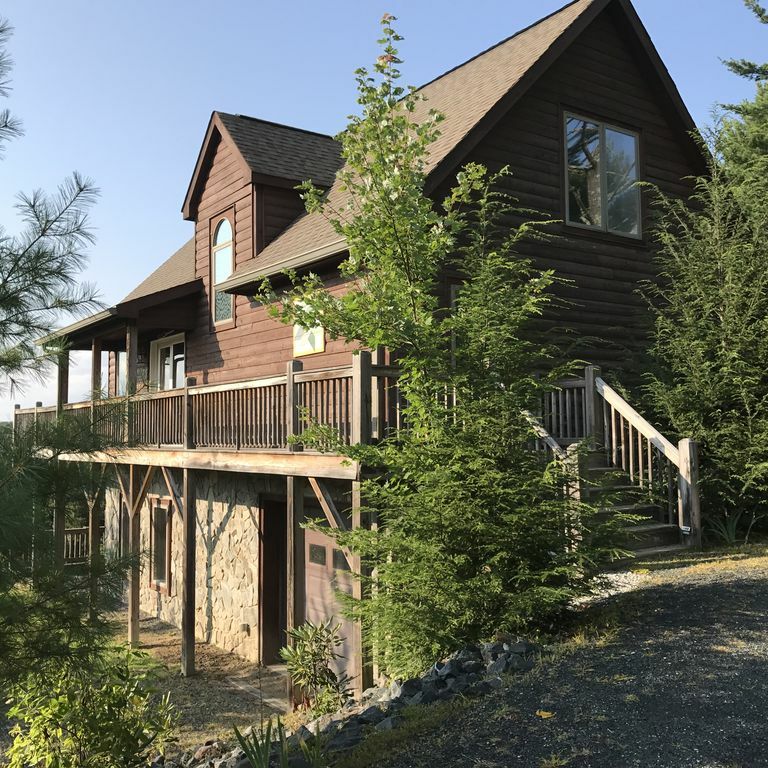 Borrowed Time Cabin features 4 bedrooms, 3 full baths, a TV/game room and dining area, convenient gas fireplace, fully equipped kitchen and a large deck providing an enchanting view of the Appalachian Mountains with a gas grill and picnic table. In the evenings, enjoy stargazing stars around the fire pit. The top floor is a Master suite with a king size bed. A bathroom that has a separate jacuzzi tub/shower and double sinks. On the main floor there are two additional bedrooms and a 2nd bathroom. One bedrooms has a full/twin bunk bed. The other bedroom has a twin/twin trundle bed. The basement level has the 4th bedroom with a queen bed that has a view of the mountains and 3rd bathroom. Going on in December in the High Country! Bathroom 1 is part of Master suite on top floor of cabin. Stainless steel glass top stove with vented microwave above. Kitchen is stocked with dishes and utensils that you would need to prepare and serve meals. We have a collection of books in the family room for your enjoyment. Please feel free to take (or leave!) books. A large DVD collection for our guests to enjoy. Beautiful views on deck. Dine outside while watching the sunset. Had a great time. Close enough to everything for convenience.Ani was a pleasure to deal with. Nice cabin. Everything that you need is there! The cabin was beautiful. But nothing is close by. Linens and towels need an upgrade. But other than that the place is super peaceful and refreshing. Thank you for your review. The housekeeper recently inventoried the linens and replaced some of them but based on this review we will replace additional inventory. We want our guests to enjoy every aspect of their stay with us! On the listing there is a map that shows exactly where the cabin is. This is a good tool in deciding where you want to lodge when you are booking. The map for the cabin shows that we are about 8 miles away from Boone, about 9 miles away from West Jefferson and 2 miles from the on-ramp to the Blue Ridge Parkway. The map give the traveler a good opportunity to see exactly the distance between the cabin and any town or grocery store, etc. You can zoom on the map and see details of names of locations. I did review the listing to insure that it does not mis-represent our location. I encourage guests to contact me if they have any questions before booking so that they feel comfortable that they have made the perfect choice for their stay. I will reply promptly! Great cabin for a family getaway! Great cabin with comfy furniture and plenty of room for two families. Great location to have a relaxing vacation and also close enough to Appalachian State to visit. The house slept us comfortably, and beautiful view of mountains, but the sheets were very worn on the bed we slept on, hair in bathtub, and just didn’t feel it was very clean. Towels met requirement but would have been better to have better towels-they were very tired. Did not mention these issues while we were there bc it was adequate. But that is why I’m giving three stars instead of 4-5. I am sorry to hear that your stay was not the experience that we strive for each one of our guests. We inspect our towels and sheets and replace any that show any wear or stains. Every guests opinion matters to us. I have spoken to the housekeeper and she will be doing a full inventory review again so that we can take any of these items out of the inventory. With the Arrival Instructions that each guests receives before check-in, we ask that the guest contact the housekeeper if they have any issues with the cleaning of the cabin. We do this to show the guests that we value their opinion and give the housekeeper an opportunity to correct the issue. It is possible that the housekeeper might miss a hair in the bathtub. Housekeeping wants to do a good job and we truly want each guest to enjoy their stay at the cabin. Also, with each guests check out, I send out a link to a quick survey where if a guest found anything lacking or below their expectations that they can point it out to us so that we can correct any issues. I also ask for ideas on things that the guests might want to see on their next stay. Even though we have been renting out the cabin successfully for many years, there is always room for us to improve. We had a wonderful time. The house was great and met all our needs..
We had a fabulous trip to Borrowed Time Cabin. There were 5 adults and 2 kids. Everyone had their own space. It is conveniently located near West Jefferson. We enjoyed the fire pit area. Very nice cabin! We have already booked this cabin for next year! Highly recommmend! I am very happy that you enjoyed the cabin and will be returning next year. Leaf Season in the Blue Ridge Mountains is truly beautiful. This beautiful property in the Blue Ridge Mountains is conveniently located just 15 minutes from the towns of Boone (home of Appalachian State University) and Jefferson. In addition we are about twenty miles from the trendy town of Blowing Rock where you can enjoy a day of shopping and dining at both sophisticated and casual stores and restaurants. All mountain activities nearby for all seasons. Our cabin usually rents for events such as Merlfest(Wilkesboro is 24 miles away), Carolina Balloonfest (Statesville is 59 miles away) and Nascars' Bristol race (Bristol raceway is 70 miles away) to name just a few events. 7th night free when booking the week! A$300 HOLD is put on you credit card (not charged) for damage deposit. 7 Night minimum for Christmas/New Years All other holidays through the year a minimum of 3 nights is required, Code to key less entry will be sent a few days before check in date.